Hot summer days can wreak havoc on your lawn or turf. CoolPro is a great tool for protecting grass on hot days without damaging roots. CoolPro is the first nozzle specifically designed for the single purpose of lightly misting the turf canopy to cool without over watering. And its 25' fogging pattern gets the job done quickly. Perfect for golf course greens and sport fields, CoolPro puts down just enough water to cool the turf. This prevents wilting but maintains the greens for active play. 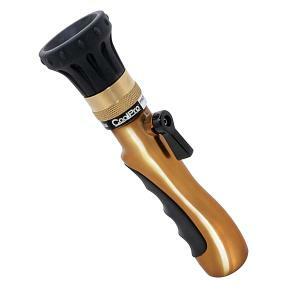 Ergonomic handle/valve provides easy grip and variable on/off control. Durable solid metal design: zinc, aircraft aluminum and stainless steel.